After two and a half weeks in our garden, I am happy to say: our hens have settled in nicely. They love their spacious new home, and have quickly started to lose the unnatural behaviour they acquired in the cramped quarters of battery cages. When they first arrived they had no idea what to do with themselves. But now, they are starting to behave just like, well… chicken. They scratch the muddy ground, dig sand baths, lay their eggs in the nest boxes, and eat a varied diet of kitchen scraps, vegetables and chicken food. I even caught one snapping up a small cockroach this morning. They have learned to go inside in a thunderstorm, or when night falls, and some even understand the principle of sleeping on the roost, though others, despite my repeated attempts to hoist them up there after dark, prefer to huddle underneath, sitting in their own poo. They also learned that life in our garden might be more fun, but that it also carries more risks. The monkeys lolling about on their roof no longer bother them, but after observing a large snake strangling and eating a squirrel a mere ten meters away, some stopped laying for a week. The 5-foot monitor lizard snooping around the run probably did not help either. Since we have seen nor snake nor lizard for a while, they are back in action, and we struggle to keep up with the 4 to 5 eggs they produce a day. The fresh air and good food is doing them well, their feathers are fluffing up, their combs straightening, and becoming less pale. And off course, like real hens, they bicker. Life in a coop is strictly hierarchical, and slowly the pecking order reveals itself. So without further ado I present our leading, laying ladies. Josephine is a large, full feathered hen, and the leader of the pack. She is especially popular with Jasmijn, who calls her my ‘knuffelkip’ (cuddly-chicken), as her feathers are lush and soft and she loves a cuddle. 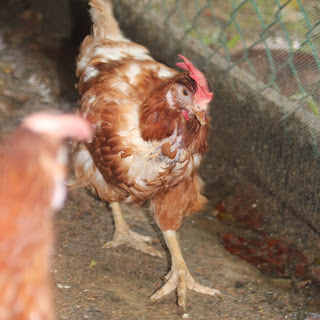 Josephine is a sociable hen, one of the first to rush over when anyone enters the run. As her position as top hen requires, she sleeps on the top roost, overseeing her flock. When there is food to be had, Josephine will put herself in prime position, standing in the middle of the dish, ensuring she gets first dibs. Keetje (a Dutch name sounding a bit like Katie) is our ragamuffin, and Linde’s favourite. Curious, cheeky and bold, she was to first to dare eat from our hands, and she rushes over if there is anything to be done or seen (or eat). The rear of her back has a large bald spot, her comb is mangy, her head featherless, and the feathers she does have are scruffy, making us suspect life at the farm has been hard on little Keetje. She seems to have found her proper position in this flock, and is turning into one happy hen, whose attention is fought over by all the neighbourhood kids, that urge Linde to ‘share’ ‘her’ hen with everyone. Wilhelmina is a large and regal looking hen, hence her royal name. Wilhelmina always looks immaculate, with never a feather out of place. She had a pale, golden colour, with a white-flecked neck. Wilhelmina is beautiful, and she looks like she knows it. First we thought she was arrogant, and aloof, and suspected her of being top hen. Later we found she is just shy, and Wilhelmina is the only one that still won’t eat from our hands. She will hover in the corner until I am well out of the way, and those other pesky hens give her enough peace to eat. Her chosen sleeping position on the floor under the roost is another indicator that, despite her royal looks and demeanour, Wilhelmina’s position in the flock is low. Feetje and Leentje look very much alike, to the extend that I still struggle to keep them apart. Both have large, drooping combs that hang over their eyes like a fringe that needs trimming. Both have knotted tails with its feathers cut off. Both have bald spots on their long necks. The main distinction is that Feetje is slightly larger than Leentje, and that her comb is even larger and floppier. Both are friendly, cheerful hens, happy to drop by when there is food to be had. Last but not least there is Tilly. Tilly is a fierce looking hen, with a dark red comb, and bright orange feathers with white, fluffy bits sticking out. Like Feetje and Leentje, Tilly stays a bit more in the background, but she is getting more confident by the day, and I suspect that when her feathers are fully recovered from life at an intensive farm, she will be a beauty indeed.